The practice is involved in high quality new buildings and refurbishment projects for both public and private clients. We have special expertise in designing low energy buildings, projects in historic settings, urban parks and gardens and individual houses and extensions. 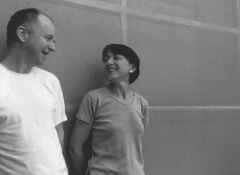 Jeremy Stacey and Rhona Fleming have been working together in Norfolk since 1992 and have established a reputation for designing innovative contemporary architecture in both public and private sectors. The practice has developed expertise in handling historic and sensitive sites and using public consultation as a key generator in the design process. This approach is rooted in a hands on experience of making, building and inventing, including a range of rural buildings which have been remodelled to form a stimulating living and working environment for the practice. With an interest in landscape, painting and music the practice seeks to find the underlying structures to feed into the work. Community buildings, where comforting, welcoming environments are created for everyone form a large proportion of the current portfolio. The practice was one of five finalists for the 2002 Prime Minister's Award for Public Buildings and has received awards from the Council for Protection of Rural England for successful integration of new buildings into historic settings.